DWR Distribution supplies, installs and services event lighting equipment from the world's top manufacturers. 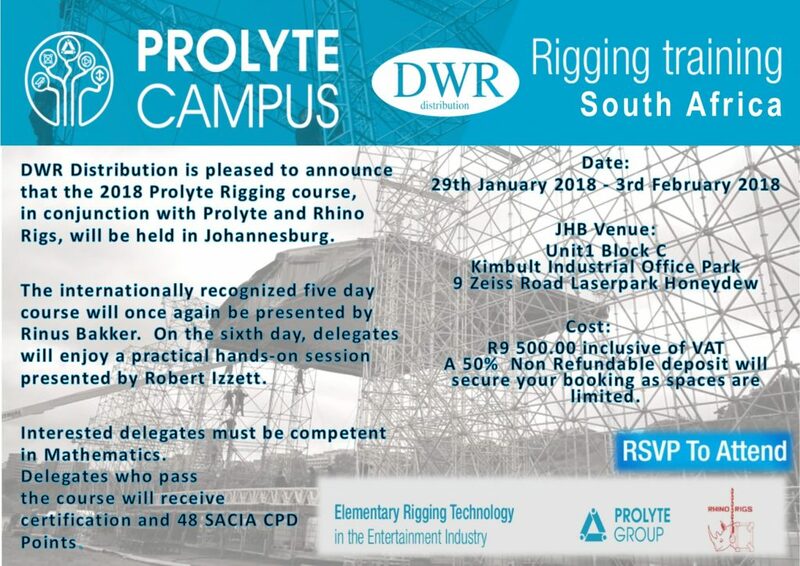 DWR Distribution is pleased to announce that the 2018 Prolyte Rigging Course, in conjunction with Prolyte and Rhino Rigs, will be held in Johannesburg from 29 January to 3 February 2018. The internationally recognized five-day course will once again be presented by Rinus Bakker. On the sixth day, delegates will enjoy a practical hands-on session presented by DWR’s Robert Izzett. Interested delegates must be competent in Mathematics. Delegates who pass the course will receive certification and 48 SACIA CPD Points. The cost is R9 500, and a 50% non-refundable deposit will secure your booking as seats are limited. The course will be held at DWR Distribution, Block C, Unit 1, Kimbult Industrial Park, 9 Zeiss Road, Laserpark Honeydew.